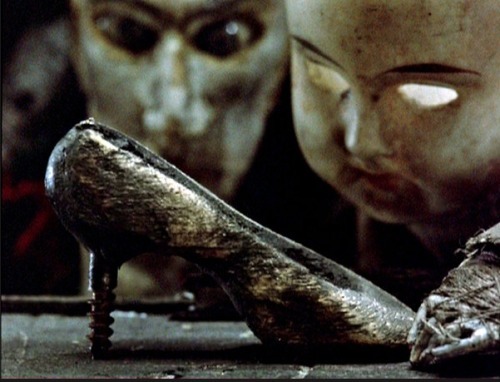 Prepping for an interview with the incredible Quay Brothers I sat down with the BFI collection of their films and wandered my way through the films. I watched all of the shorts yet again- this time paying more attention so that I could speak to the brothers intelligently. • Nocturna Artificialia (1979)- The Quays “first” film. Its included in collections as an extra away from the other films. I’m not sure why since it’s not a bad film. Interestingly the film is a kind of cheat sheet for the Brother’s following films with riffs, ideas and sequences that showed up in other films. • The Cabinet of Jan Švankmajer (1984)- the music haunts me, but not one of my favorite films. Made not long after their discovery of Svankmajer doesn’t click with me as a whole despite pieces working very well. • The Epic of Gilgamesh, or This Unnameable Little Broom (1985) a.k.a. Little Songs of the Chief Officer of Hunar Louse- Not as good as some of their other films. For me the film reminds me too much of the work of other animators, in particular the animators that they admire. • Stille Nacht I: Dramolet (1988)- First of a series of short nightmares. Just wickedly cool. • De Artificiali Perspectiva, or Anamorphosis (1991)- I love this film. It plays like an animated Peter Greenaway film. Its very much like the films Greenaway is making with his current obsessions on perspective. • The Phantom Museum: Random Forays Into the Vaults of Sir Henry Wellcome's Medical Collection (2003)- glorious precursor to the Mutter Museum film. Zeitgeist Films is releasing a Blu-Ray of the shorts on October 20th. Look for more coverage and my interview with the Quays at that time.